Vanity bath bar light, 18", uses medium base bulbs, 100 watt maximum (not included). cULus Listed. Vanity bath bar light, 18", uses medium base bulbs, 100 watt maximum (not included). cULus Listed. Frosted pleated glass shade. 5-1/2" length x 9" height x 7-5/8" depth. Uses clear medium base bulbs, 60 watt maximum. (not included). cULus Listed. Vanity bath bar lights. 24", uses medium base bulbs, 100 watt maximum (not included). cULus Listed. Alabaster glass shade. 5" long x 8" high x 7-1/4" deep. Uses clear medium base bulbs, 60 watt maximum. (not included). cULus Listed. Vanity bath bar light, 18", uses medium base bulbs, 100 watt maximum (not included). cULus Listed. Vanity bath bar light, 36", uses medium base bulbs. 100 watt maximum, (not included). cULus Listed. 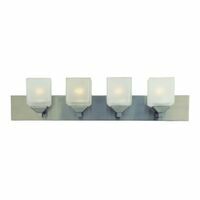 Vanity bath bar light, 36", uses medium base bulbs. 100 watt maximum, (not included). cULus Listed. Vanity bath bar lights. 24", uses medium base bulbs, 100 watt maximum (not included). cULus Listed. Frosted pleated glass shade. 24" long x 8-1/2" high x 7-1/4" deep. Uses 3 clear medium base bulbs, 60 watt maximum. (not included). cULus Listed. Use clear medium base bulb, 60 watt maximum (not included). 13-3/4" width x 9-3/8" height x 7-1/2" length. Use clear medium base bulb, 60 watt maximum (not included). 13-3/4" width x 9-3/8" height x 7-1/2" length. Alabaster glass shade. 24" long x 7" high x 7-1/4" deep. Uses 3 clear medium base bulbs, 60 watt maximum. (not included). cULus Listed. Use clear medium base bulb, 60 watt maximum (not included). 18-1/8" width x 9-3/8" height x 7-1/2" length. Frosted pleated glass shade. 30" long x 8-1/2" high x 7-1/4" deep. Uses 4 clear medium base bulbs, 60 watt maximum. (not included). cULus Listed. Frosted glass shade. 18-1/8" width x 9-3/8" height x 7-1/2" extension. Uses clear medium base bulbs 60 watt maximum, (not included). cULus Listed. Steel fixture, frosted glass shades. Uses three medium base, 60 watt maximum, (not included). 7-1/2" height x 23-3/4" width. cULus Listed. Alabaster glass shade. 30" long x 7" high x 7-1/4" deep. Uses 4 clear medium base bulbs, 60 watt maximum. (not included). cULus Listed. Bel-Air Bath Bar Light, Square, Medium Lamp Base, 100 W Lamp, 4 Lamps, Metal/Frosted Glass Shade, Wall Mounting, Pewter Housing, 6-3/4 in Height X 30 in Width X 6 in Depth, For Indoor Applications Use clear medium base bulb, 60 watt maximum (not included). 24-7/8" width x 9-3/8" height x 7-1/2" length.